Photo by Maria Elena and used here with Creative Commons license. Blurb has long been known for its focus on high-quality, full-color, print-on-demand books, and it also has arguably the easiest-to-use DIY tools for building color books. These two features have long attracted authors despite the prohibitively high cost of color POD. But before the release of new features and services in April, I could only recommend its services to authors who wanted a small quantity of personal books, color proofs, or advance reading copies. Blurb recently added an offset color book printing service, warehousing and fulfillment, distribution to Amazon.com and Apple’s iBookstore, with rumors of Ingram distribution to come soon. Its suite of book creation tools serve rank beginners and professional designers and everyone in between. Most impressively, its midlevel BookWright tool concurrently builds a fixed-format EPUB version of your book for the iPad. In short, its feature set and services are finally robust enough that I can very heartily recommend them to all authors of color books as a do-it-yourself option that competes with the services of a book designer and even against Vook and BookBaby’s very good do-it-for-you services. I think they’ve done a great job in serving this very difficult to satisfy market. Let’s take a closer look at what they offer today. Blurb provides four different tools for four different kinds of authors: Bookify, BookWright, Blurb for InDesign, and Blurb for LightRoom. It also has some pretty nice tools for mobile, Word users, and for authors who already have a PDF of their book. 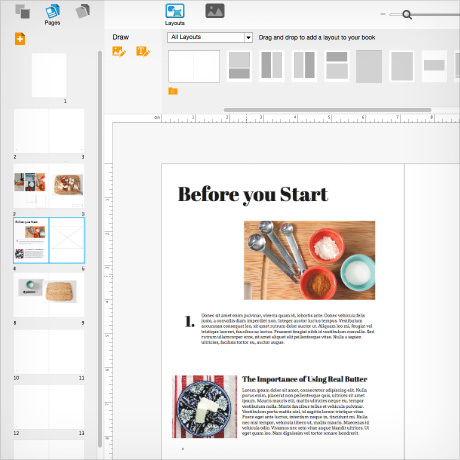 My recommendation for complete newbies or the tech-shy is Bookify, a WYSIWYG (What You See Is What You Get) cloud-based book design tool that lets you choose from six predesigned templates. Simply choose a template, fill in the blanks, and you have a book that’s ready to publish, print and distribute. Import photos from your computer or iPhoto, Instagram, Facebook, Picasa, Flickr, SmugMug, 500px and Zenfolio. When you’re done you can create a fixed-format EPUB using their e-book editor. For the pros, I recommend Blurb for InDesign, a plugin that allows authors and professional designers to design books directly within InDesign. At any point in the process you can generate a fixed-format EPUB to see what it looks like on the iPad. Bookify and BookWright users can import their files into Blurb for InDesign. If you’re a pro book designer you might suggest that clients first sketch out a book concept in Bookify or BookWright to save time, money and miscommunication. For professional photographers I recommend Blurb for LightRoom, which integrates with the program to add just another step in the photo management and editing workflow. There are over 100 layouts to choose from and the print book can be converted to a fixed-format EPUB using the Blurb e-book tool. I know a lot of professional photographers who use LightRoom, and I think they will be thrilled with this new ability to easily create portfolios and to collaborate on books with their customers that, for example, combine shots from a product launch with promotional copy. 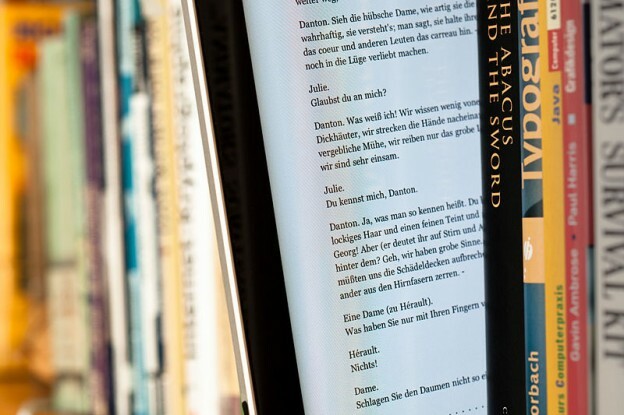 The Blurb e-book tool allows authors to edit books for reading devices and add multimedia, too. There is an “add-in” for Microsoft Word that I can see would be useful in conjunction with a book designed in Word, such as with an Amazon CreateSpace template or, better yet, one of Joel Friedlander’s more professional-looking Book Design Templates. If you already have a PDF, Blurb offers a PDF to Book tool. Finally, a Blurb Mobile bookmaking app for the iPhone lets everyone be an author by creating a story sequence from the photos and video clips on the iPhone. Add captions and even an audio soundtrack. This has a lot of potential for fun, for events, travel, and even for serious journalism. Authors can share stories via social media and send stories to friends, family or colleagues via a private link. Blurb Mobile also lets you print a 7×7 photo book directly from the iPhone. Blurb’s services drastically simplify that flow. Now authors can use Blurb to reach Amazon with their professionally printed color book, and Apple with fixed-format EPUB to the iBookstore. Hopefully Blurb will solidify a deal with Ingram soon, and that will handle the rest of the online retailers. Even if Blurb’s offset printing pricing is higher than others it could be worthwhile, as hand-fulfilling is time-consuming and Small Press United and similar exclusive distribution services take a very big percentage of book sales. Authors who really want to push book sales to brick-and-mortar bookstores will still need to use Ingram’s tools (Lightning Source for publishers, IngramSpark for self-publishers), which allows you to set the discounts and returns program that bookstores insist upon. Blurb does not charge authors to sell books. Bookmakers get 100 percent of profits, after the charge to print and deliver and, if selling through Amazon, their fee (15 percent of the list price and a handling fee). Blurb pays authors monthly via PayPal. Blurb makes their money from printing books and also from some services, such as enrollment in the Blurb to Amazon program ($29.99 per book after the introductory period), and book setup fees. The Blurb to Amazon program includes an option to include one of their free ISBN numbers but, as I wrote way back in March 2010, I very strongly advise that every indie author buy your own set of 10 ISBN numbers directly from Bowker for $250. (Members of the Independent Book Publishers Association get a 20 percent discount on this and many other useful products and services, not to mention a large network and educational program.) Blurb’s Amazon distribution launched with its U.S., U.K., Canadian, and Australian markets, with more EU domains becoming available by the end of 2014. Indie publishers know that offset printing is a pain point because of storage and distribution. Blurb has solved this with the Amazon distribution program (and Ingram distribution rumored to be coming soon). Their new “Agile Fulfillment Program” (AFG) warehouses books in their facility as they wait to be sent to readers and retailers. There’s a charge of $1-2 per book (depending on size), which covers storage, handling, fulfillment, shipping, and so forth. My only experience with Blurb has been to create color POD books and I had not realized that Blurb had an e-book creation tool before Boyer pointed it out to me. 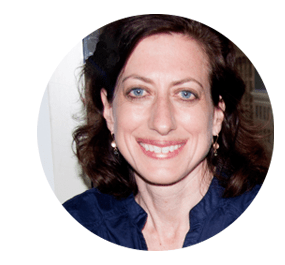 “Blurb’s e-book creation tool is our best-kept secret,” she said. They’ve had it for a year, but the BookWright tool takes it to the next level, building fixed format EPUB at the same time that the print book is being built. This is, in my opinion, simply huge. How did Blurb do that when the whole industry, including Adobe with InDesign, struggles with this? Allan Karl’s book, with its custom book size, was not set up with the fixed-format EPUB layout in mind. The answer was an unequivocal and unexpected yes. Doing it. Tomorrow. And telling my friends who have full color books in InDesign, like Allan Karl, who I wrote about in my piece about crowdfunding for his Kickstarter author success. I put Karl and Boyer together to talk about creating an e-book from his print files. Unfortunately, Karl had chosen a print book dimension that does not work for fixed-format e-book layouts. Boyer’s advice to Karl was to use the Blurb for InDesign plugin, since his book is already in InDesign. (Otherwise she’d recommend BookWright for a print and e-book solution.) “Using the plugin, you can simply link to an existing InDesign file, then select the trim size/aspect ratio (e.g. Landscape), and then choose the e-book output option.” Some rearranging will be necessary of course, but Karl is relieved to retain creative control of his e-book in a low-cost solution. In conclusion, Blurb is now extremely attractive to self-publishing color book authors with their easy-to-use tools, affordable printing services, and a growing distribution network. Blurb has a great reputation for quality, and they offer lots of attractive options like hardback cover with dust jacket, end sheets, and paper stocks that picky color book authors are willing to pay for. The tools are so easy to use that some authors may even be swayed away from do-it-for-you services from Vook and BookBaby. And certainly budget-minded authors will opt to use the tools in lieu of paying professional designers. Who is Blurb not for? Professional indie author and small press who use InDesign and have already climbed the learning curve with Ingram’s Lightning Source (or the new IngramSpark). A direct relationship with Ingram will always be more cost effective then using an intermediary. And access to bookstores is very important to small press and ambitious indie authors. For multimedia book creators Aerbook, along with Apple’s iBooks Author, remain leaders in easy-to-use creation tools for sophisticated multimedia e-books. Blurb’s multimedia options are not that robust yet. Blurb does not yet compete in the “wordy” book market either, as their per-book pricing is so much higher. But authors with travel books who want to include high-quality images inside their mostly-text books will be looking to Blurb to fulfill that need. Blurb also enables authors with trade paperback books to offer a new edition with full-color pages. Today, Vook, BookBaby, IngramSpark, and Amazon CreateSpace have the majority hold on trade (print) book for self-publishers. All but the latter also offer e-book creation and distribution services, including fixed-format EPUB. Authors who want robust multimedia features may use Aerbook, too, or Vook, or any one of a number of other tools and services. Some authors will choose to create print and e-book files using Blurb and distribute with IngramSpark, who has the largest reach into retail markets. Others will use Blurb as an end-to-end solution and wait for their Ingram distribution deal. Still others will may add Aerbook for multimedia book creation and distribution. None of these services insist upon exclusivity, so it’s up to you to manage your creation, distribution and sales channels. That’s right, becoming an indie publisher and selecting the best toolset is not an easy task. Choose carefully and keep records so you don’t forget who is distributing to which book retailers. To help you decide, here’s a list of vendors that I recommend you research alongside Blurb for creating and distributing your full-color print books and fixed-format EPUBs. Vook is a do-it-for-you color print and multimedia e-book creation and POD distribution service with Ingram distribution. They have a DIY book creation tool upon request. Like Blurb and Amazon CreateSpace/Kindle, they offer their own online store. BookBaby offers separate do-it-for-you fixed-format e-book creation services, color print book creation services and short-run printing. Aerbook offers a color e-book creation tool but their strength is allowing authors to create social fliers that market and sell books directly within social apps and streams, including Twitter, Pinterest and Facebook. Amazon CreateSpace excels in getting your book into the Amazon store. Since CreateSpace doesn’t do color well, it’s great that Blurb fills that gap. I suspect that for art book creators, photography and cookbook authors, children’s book authors, and graphic novelists, Blurb will be the No. 1 choice, at least for do-it-yourselfers. What do you think? Do you have other vendors to add to my list? I look forward to learning how these options stack up for you against the competition and why. Let me hear your thoughts in the comments below. Correction: This story has been altered to update what services Aerbook offers. Very interesting to learn about.